First, we want to make sure you know about this THURSDAY event. 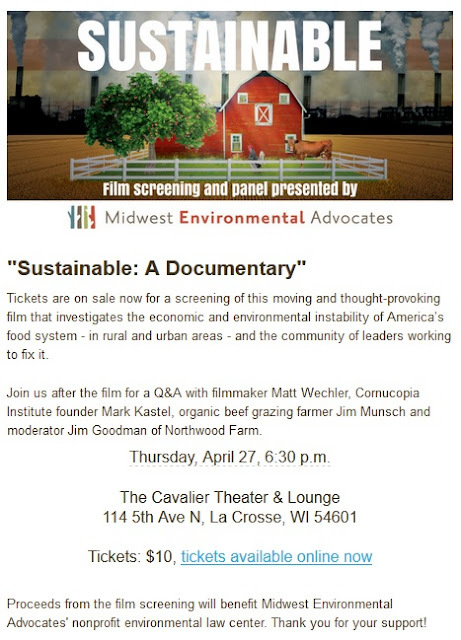 Midwest Environmental Advocates is an important ally against the degradation of our environment. Please attend this fundraiser if you can. If you can't please donate to MEA online. NOTE: TICKETS ARE AVAILABLE AT THE DOOR. Now, in date order (subject to updating = please email if your event is missing (include link to event page or flyer please). April 22 - 29 is BEE WEEK in La Crosse. Join Assembly Democratic Leader Peter Barca, Assistant Leader Dianne Hesselbein, and Democratic Caucus Chair Mark Spreitzer for an event hosted by Assistant Caucus Chair Steve Doyle to benefit the Assembly Democratic Campaign Committee from 5 to 7 p.m. at Moxie's, 1835 Rose Street. Suggested donation is $50 (please make checks out to ADCC.) You can also donate online. The Fair Elections Project will hold a Fair Maps Town Hall at 6:30 p.m. at the Onalaska Public Library. The Fair Elections Project supported a Wisconsin lawsuit claiming that current districts are unconstitutional. In November, they won their suit and a new map has been ordered. At 7:00 p.m. Dr. Vincent Her of UWL will talk about his experience attending a conference and research trip in Southeast Asia. He will blend multi-sited research and personal history to reflect on the experiences of transnational migration, the impact of tourism on village life in Thailand and the need to question concepts such as global citizenship and global identity when national borders remain seemingly impermeable. The event is free and open to the public. At 3:30 p.m. UWL will host a TEDx Salon talk with Adam Carroll, an internationally recognized financial literacy expert, author of Winning The Money Game, a two-time TED talk speaker and founder of MoneySavvy.com. This event is free and open to the public. At 5 p.m. Yale physicist Susan Demers, Ph.D., will describe the Large Hadron Collider, and will talk about the discovery of the Higgs Boson, and where we are headed. The talk is free and open to the public. ALANA (UWL) hosts its annual Phenomenal Wymen Dinner with keynoter Adrian Lipscombe. PURCHASE DINNER TICKETS BY APRIL 26. At 10 a.m. you can attend an Arbor Day Walkabout presented by Randy Mell, University of Wisconsin Extension Natural Resources Educator to learn about trees in our neighborhoods. This event requires a registration fee. Workers Memorial Day will be commemorated at 5 p.m. at Green Island Park in La Crosse. 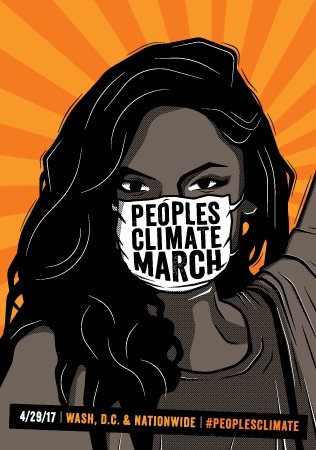 Join a Peoples Climate March in La Crosse (start in Cameron Park at 11 am, march to Riverside, return to Cameron Park per the organizer) or Winona. In Eau Claire, Citizen Action Organizing Coop of western Wisconsin will hold its annual meeting from 1 to 4 p.m. in Unity Christ Center 1808 Folsom St.. Mike McCabe will speak at the event (free and open to the public). More than 200 people form the co-op by contributing monthly to employ a full time organizer to advocate for and help organize the activist community. It's Neighbors Day in La Crosse. Earth Fair in La Crosse.